40 Dart 18s went to Restronguet Sailing Club over the “long” weekend of the 1st to the 3rd July to where it all began 40 years ago when the trail blazing and mould shattering (not literally) prototype Dart 18 was launched in great secrecy complete with Americas Cup type screens covering the hulls and appendages, into Falmouth Bay. The original boat is now proudly on display at the National Maritime Museum at Falmouth, Restronguet have a strong and keen 18 fleet and Windsport International, the fleet manufacturer and event support, are based right by the Sailing Club meaning the fleets association with the area will continue for a long time to come. Jeremy Underwood – who had attended the first ever Dart 18 Nationals, held naturally at Restronguet – was present together with various teams who had taken part in the, what seems like yesterday, 25th Nationals again held at the Club. Boats started to arrive on the Thursday having negotiated the road works on the A30. Those rigging up were entertained by Andy Kelley’s search for the source of a rattle in one of his hulls only to find having stood it on its end that it was caused by an empty bottle of cider! More Teams arrived overnight having dealt with the closure of the A30 including a contingent from the UK who had been in France having taken part in the French Nationals. All campervans and tents were accommodated on the Windsport camping field from where spectacular views of the Bay were available with the camper vans having tacked uphill to avoid getting stuck in the wet grass. Others chose local B&Bs, hotels and holiday cottages. Friday was the day of the Windsport Challenge a timed nautical (with alternative walking route for supporters) treasure hunt requiring competitors to visit locations with different degrees of difficulty against the clock. The weather was a bit unhelpful with a strong gusty wind and rain squalls making it hard to achieve some of the navigational and manoeuvrability trials called for to gain maximum points. Only two Teams visited all the waypoints, one of who, Mike and Wendy Jones had had to ask for a new list of waypoints to be e mailed to their non-waterproof phone as the laminated copy they had been given had gone for a swim. Many other Teams, including a strong cohort from North Devon, chose to specialise in or linger at those halts involving local hostelries serving pasties, beer, or both. If that was not enough excitement for the day the opportunity was also being taken to obtain video footage by Mike Smith of Boxhead Media for Dart 18 and Sprint 15 promotional videos. 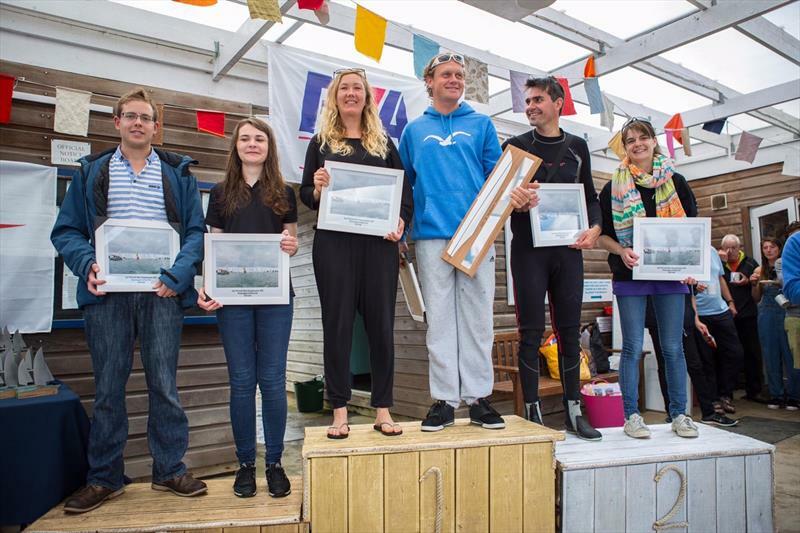 This involved making best use of the occasional sunny intervals, just there to show what the weather could have done had it wanted to, to demonstrate rigging up and sailing the boats and interviewing competitors to say why their boats are so great. The promotional footage also included on the water filming during which (back from Rio) Tom Phipps, Olympic catamaran contender, crewed by his (my preparation was I bought a dress with boats on) sister Katy managed to capsize in a gust that unfortunately was not captured on film. Both have strong but differing views as to the cause of the capsize. That evening a sponsored barbeque with free beer from On Mile Ends Brewery and cider from Paul Chadwick took place in a Barn on the site during which one of the fathers of the Dart, Ian Fraser, gave an impromptu talk as to its gestation and history after which he rashly asked for any questions an opportunity the fleet took with relish. At the end of the barbeque, at which everyone was thanked by her husband accept Cookie the cook, the competitors retired to a local wine bar but the lure of the remaining free beer in the barn was such that they returned and then played increasingly dodgy gymnastic and climbing games until the small hours. Saturday things got more serious with the remaining competitors arriving and rigging up before the 11am briefing. At the briefing, during which Jenny Lloyd had to be persuaded by husband Geoff not to use one of the poles holding up the Club roof as a dancing aid, it was made clear by the Race Officer, Head Master Fraser, that starts would be on time, recalls were not going to be tolerated and all boats would behave. Some chance! The 40 boats launched and crossed the Bay in a still somewhat gusty but generally strong wind again with helpings of rain. The courses were windward leeward meaning the start line was in close proximity to the far shore so as to allow a decent length beat. The starts were generally well behaved although one recall led to the use of a black flag and one team, new class Chairman and heavy weather expert Sean O’Connor crewed by wife Helen coming in for an early pasty. The key trick was to get off the line well and then judge when to tack so as to maximise the possible gusts and lifts to get to the windward mark. This was not easy with many winners and losers. The downwind legs were marginally easier to call but the best route varied each lap just to keep things interesting. With 40 boats careering around fast in a restricted area incidents are bound to occur with much shouting and screaming at or near marks, various capsizes and shunts and bumps one of which involved Tom Parker who only that morning had been complaining about how much his insurance had gone up and the other the ramming and holing of a virtually brand new boat by Mike Gomme and Sara Stones in an almost as new boat. Subsequently they won the protest. 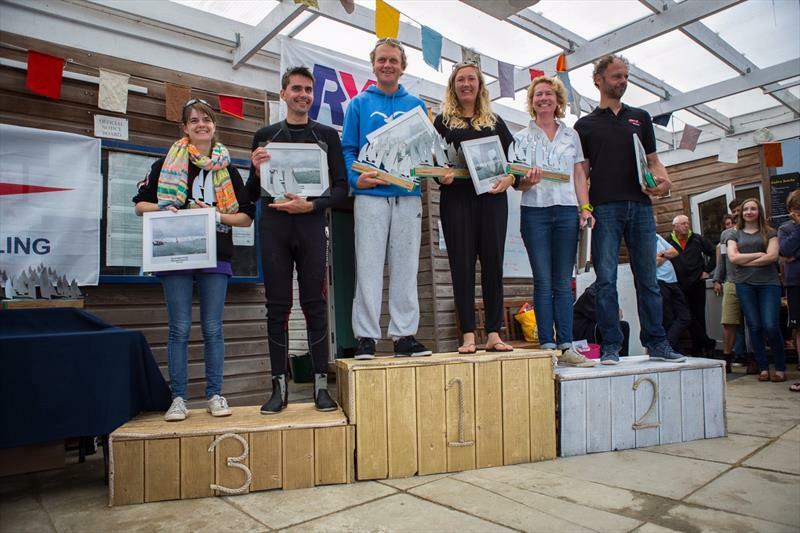 The race winners for the day were Dan and Amy Teubert and Nicolette Van Gorp and Raud Van Gisberge with Fraser Manning and Erica King getting a second place as did Mike Gomme and Sara Stones with thirds from Mike and Wendy Jones. This left it tight at the top and all too play for on Day Two. That night was one of the Dart 18 social high spots of the year with a barbeque and live band night with a Cornish twist given the stage was assembled from a farm trailer covered in hay bales tractored in especially that morning. The band Night Tickers and supporting act Polly Money were brilliant with much dancing, a one-off virtuoso singing performance of a classic 80s rock ballad by Katy Phipps and a rather enthusiastic if somewhat slurred version of Hey Jude sung by all as a finale by all present. Post-party the sensible competitors had an early night, the less so retired to a house in the village and the least-so to around a fire on the beach. Notably at least two of the possible winners were seen at the beach party! Following morning racing started allegedly at 10:30 however one thing was missing, wind. For one competitor it was also clear that suntan lotion had been missing from his kitbag the day before given his feet and ankles were white, his upper thighs white but the rest of his legs bright red. The course was set and most of the fleet drifted or paddled out to it with a few looking at the forecast, the lack of wind and the rain clouds as a chance to give up and pack up early. For most of the morning they were proved right with the fleet being returned to shore around lunchtime. However, allegedly as predicted by the Race Management Team, over lunch the weather changed and a slight but noticeable sea breeze established allowing two more decent races to take place. These were light wind affairs with the beat against the incoming tide giving tactical choices which side of the main channel to use. Initially going left paid but later on the right was the better option. Obviously inspired by the change in conditions Des Barnes crewed by Eloise Knott were on fire winning both races by a huge margin closely pursued in Race Three by Andy Kelley and Tory Hackman with Dan and Amy Teubert third and in Race Four by Dan and Amy, second, with Nicolette and Raud third. The fleet sailed in with Dan and Amy still trying to remember if whether in the case of a draw it was number of firsts or position in the last race that prevailed. On shore they then ran around asking all and sundry getting a wide variety of answers! All in all another in the Dart 18 40th year celebration of great events. 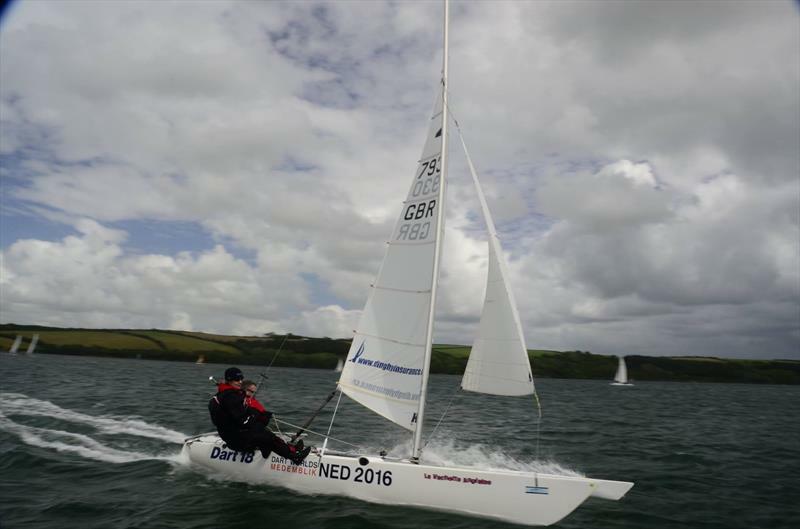 Some of the fleet will reconvene at the East Coast Piers Race (9th and 10th July) before the World Championships at Medemblik in Holland 31st July to the 6th August with over 120 boats expected 40 of which will be from the UK. Hopefully by them Mike Gomme or more likely his wife Yvette will have worked out a system to avoid loss or terminal damage of phone, wallet, shades and clothes all as occurred at Restronguet. The list of who to thank is long but they all contributed to a great event with the accolade that Restronguet/Windsport are already being asked about the arrangements for the 50th anniversary do and when the Sprint 15 Catamaran Fleet can come. Credit must be given to the home club competitors many of whom finished well within the top of the fleet having shown all “them foreigners” (or Emmets) how to do it. More information and a series of random photographs currently featuring the on shore activities but soon to be supplemented by on the water ones are available on the UKIDA Dart 18 and the Dart 18 SW Championship Facebook Pages. Special thanks to our sponsors, Windsport, John Tuckwell (GJW Direct Insurance), Ian Fraser and On Mile Ends Brewery. Thanks to the organisers notably Alex Metcalf, the on the water race team headed up by Ian Fraser the galley staff, Cookie Phipps for the barbeque on the Saturday night, all the Club Members and helpers who made us all feel welcome, the Protest Committee and Lynn Stonehouse for designing the magnificent one off trophies. Finally thanks to Elle Peirce for all the on the water pictures.